My three youngest kids are back to school. I was so ready, but don’t tell them. We are taking my oldest to The University of Kansas on Sunday, and I am not in the least bit ready for that. I know we are entering a new chapter in our family life and there are a ton of fun times ahead, but I’m just not quite ready. This summer just flew by, and once again I want to apologize for my lack of posting. Now that things are a little more ordered, I hope to get back to posting regularly. I have missed you! Looking for a light refreshing dip to help get through the last days of summer? 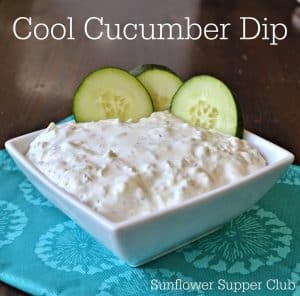 This is great dip for crackers, veggies, or to make little cucumber sandwiches. We enjoy it with baby carrots and red bell pepper strips. Cover and chill for a few hours to allow the flavors to blend.